For one so all-worthy ? Not craft only: hatred ! But with a man´s heart. - The complete Sonatorrek has 23 stanzas, of which the last (and most beautiful, to me!) six are quoted here. 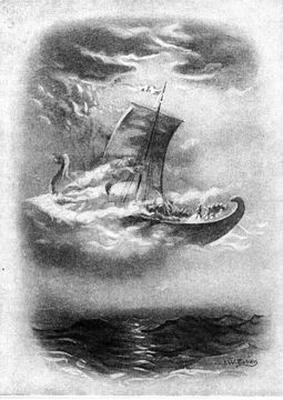 - Egil´s son had drowned, and Egil blames Odin for taking his son from him and enjoying his company in the afterlife. Another example of one *not* dying in *battle* still going to Odin !